In PHSE, the students have been learning about their rights and responsibilities in their communities. They did research about different places that people can get help in their community and made posters and anti-bullying posters. This half term, for British Values, S1 looked at Democracy. They learned about voting, elections, campaigns and candidates. 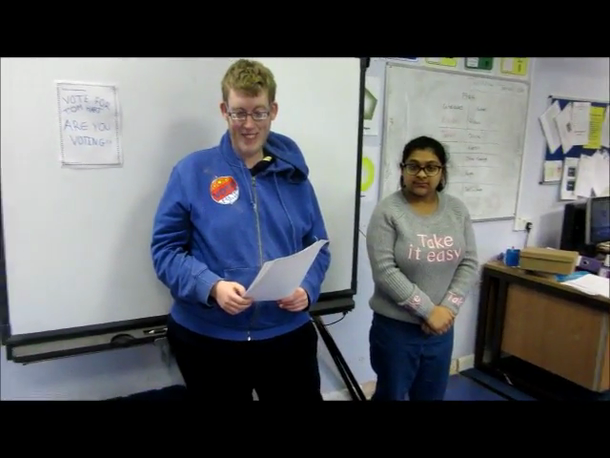 Some of the students nominated themselves to be a candidate for their School Council Representative Election. They worked in pairs and small groups to put together a campaign for their candidates. They then needed to present to the rest of the class. All the students and staff then had a ballot paper to anonymously vote for who they thought had put together the best campaign. The votes were counted by an independent adjudicator, which resulted in a tie! 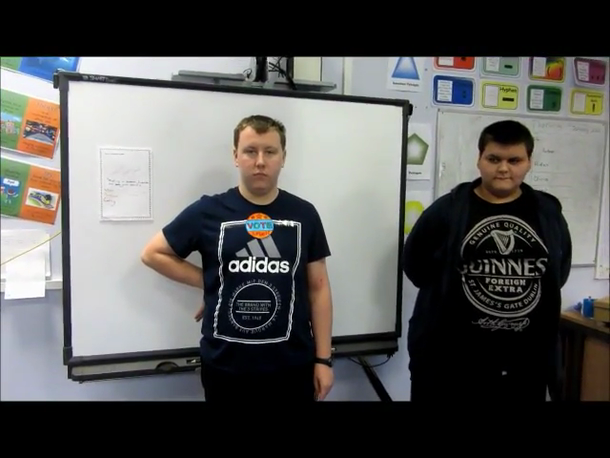 Lewis and Brandon, with the most votes, were then voted for with new ballot papers and Brandon became the new S1 School Council Representative. Lewis was the first to congratulate Brandon on his success. Well done to all the students on their campaigns. For Black History Month, S1 looked at Martin Luther King's I Have A Dream speech. They discussed issues in the world today and did a whole class mind map. Then, they had to choose the world issues they were passionate about and write their own I Have a Dream speeches. George has been learning how to find images on the internet from a given word list, copy and paste them into a Publisher document and label them by creating and typing in a text box. He used some of the words from the mind map of world problems to create his Black History Month poster. In DT, S1 have been making a jewellery stand. They had to make their own ply wood by sticking thin sheets of wood (veneer) together and pressing them in a vice. They drew around their hands, then cut the shape and sanded it smooth. Next, the students had to design and cut the shape of their base before sticking the two together.